One of the best restaurants in Lawton is "El Greco". 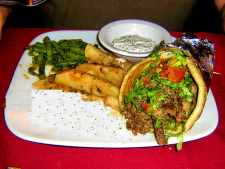 The restaurant serves Greek food prepared in an authentic kitchen. Try the chicken souvlaki. The chicken souvlaki is grilled to perfection and includes salad, pita, roasted potatoes and green beans, along with a flavorful tzatziki sauce. The food is delicious and service is good. This restaurant is located at 10 NW Mission Blvd, #B in Lawton.